In this episode of the IT Provider Network Podcast, I want to share with you some ways to do a better job prospecting, get more first appointments and land more MSP contracts. However, I just want to clear the air right away, if you’re looking for a silver bullet you ain’t going to find it here. I am going to share with you some of what we’ve done to get over 15,000 contacts in our database and hundreds of first appointments over the last 10 years and why I think that’s the key to your ongoing success. Regardless of how many people you have in your company everyone that works for you is in your sales and marketing departments. Make sure you communicate this to them and they understand that EVERYTHING they do is a reflection on your company. The way they are seen in the “outside world” is how you will be perceived. The way they look, how they dress is a 100% reflection on your company, the company that you have built. Are you paying mileage? Why not get a mobile billboard or a fleet of them! After we land a new client we always schedule an all-hands meeting with the team to take them through the sales process that occurred with the new client. We talk about the leadership of the new company, the reason we feel that they trusted us with their IT needs and what were the key points we brought up with them in the sales cycle. We try to get the whole company preaching from the same hymn book so when they are talking about the company, our services or our team we are all using the same vocabulary and everyone in the company becomes part of the sales force. Account Management – Working our Installed Base for new opportunities for upsells and cross-sells. The truth of the matter is this was completely unrealistic and would even if he was able to be successful in all these roles something would suffer. You can’t meet people from behind your desk or by sticking your head in a computer. You need to get out there and network. You won’t be good at this at first and you may feel uncomfortable but start building your network in person. Think about events during the work day but also ones in the early morning or evening. Try to attend a mix of tradeshows, industry events, meetings, and seminars. Don’t forget seminars and meetings where your prospects live. Offer to speak at THEIR industry events, spend time at events with your clients. They can introduce you to their peers. As they say, the fortune is in the follow-up. When you are networking have a plan to follow up and cement the relationships you are building. There are a lot of ways to follow up and I encourage you to find out what works for you but the key is to just do it. Make a system for yourself and follow it. If you use Connectwise, Hubspot or any other tool that allows for some marketing automation you can assign a track to a prospect and have that track or workflow assign you an activity. If you are using LinkedIn, drop the new contact into your CRM and make a note of any mutual connections so that you can use that to get leverage with the new prospect. I have an intern that uses my LinkedIn Sales Navigator license to look for contacts that might be good potential clients, I have him search for 2nd level connections, in other words, connections that have a mutual contact with me. Then we put this into our marketing system along with the mutual contact. Now we have a potential lead and something that ties that new lead to us. This makes it so much easier to break the ice. Look for people that have jobs to fill and reach out to them with a simple yes-no question. Speaking of breaking the ice, you need a premise. 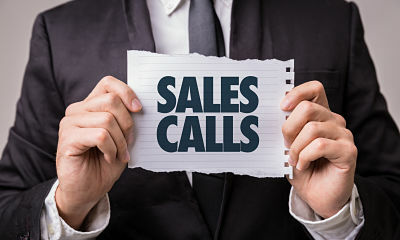 The vast majority of the success or failure of your cold calling activities happens before you even pick up the phone. The key is in your mindset and how you approach the call. You need to create your own theater of the mind. If you have ever listened to anyone like Tony Robbins he talks about the power of your mind and just be changing the associations you have with certain actions you can drastically change your day, your life and your business. I know it sounds crazy but have some daily affirmations that you can tell yourself before you start prospecting. See yourself being successful in the call and getting through to the prospect. Funny story about the power of suggestion and the need for a good premise that you believe in. One year around December my inside sales guy was having a rough week. He must have been rejected quite a bit and wasn’t getting through to many DM’s – decision makers. Somehow, I convinced him to use a different premise for his calls. I told him to tell the gatekeeper – the person answering the phone – that his boss had met the decision maker at a holiday party and he was trying to set an appointment to follow up on how we could help their company make the most of the technology in their company. This one little thing, the fabricated holiday party meeting, rejuvenated him and drastically improved his contact ratio. It was all about his belief, all about his level of confidence. The premise doesn’t matter as long as you believe it and the client does too. Imagine this, you went to the Doctor with your son or daughter. Your child was gravely ill and the doctor determined that your child had some serious disease like cancer. Then the doctor looked at you and saw you had Wal-Mart sneakers on and maybe your shirt was a little tattered. He saw this and he prescribed the approach to your child’s illness that he thought you could afford. Would you ever want a doctor to do this? Of course not. You want a doctor to give you advice on what is best for your child, not some perceived notion of what you could afford. GET OUT OF YOUR OWN HEAD, don’t make assumptions based on what you think your prospect can afford. Give them the right prescription for what ails them – give it to them straight. Listen to the show I talked about the ID Agent Dark Web Monitoring Service and how I use it for prospecting.